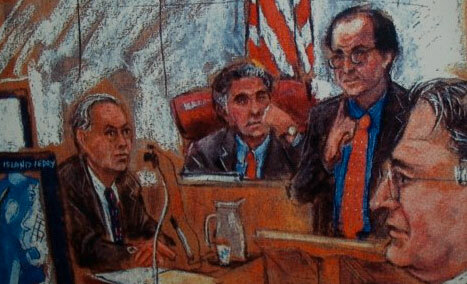 Attorney Frisch conducts a hearing into the 2003 crash of the Staten Island Ferry which killed eleven passengers. Practicing in New York City's federal and state courts for over thirty years, Andrew J. Frisch is renowned for devotion to his clients and determined advocacy in championing their causes through federal and state criminal and civil investigations, trials, appeals and SEC administrative proceedings. Andy's focused practice affords him the incomparable satisfaction of fighting for his clients, unencumbered by typical law firm agendas. He provides the best possible representation with unequaled personal commitment. Served the United States Department of Justice as a federal prosecutor for eleven years, prosecuting business and securities frauds, public corruption, environmental crimes and violent criminal enterprises. Has litigated hundreds of cases to completion, including over 30 jury trials and over 100 appeals. Won acquittals, dismissals or deadlocks of 106 counts against the former Chief Financial Officer of Dewey & LeBoeuf LLP, charged with defrauding the global law firm's creditors. Won acquittal after federal jury trial of a physician alleged to have interfered with a federal investigation. Won acquittal after federal jury trial of an entrepeneur charged with using extortionate means to collect a debt. Won pretrial dismissal of federal indictment charging accomplished physician with health care fraud. Won sentence of time served for Australian chat moderator of Silk Road website. "Silk Road Member Avoids Further Jail," Sydney Morning Herald. Won appeal in the United States Court of Appeals for the Second Circuit from a securities fraud judgment against a Prudential broker charged with market timing. "Second Circuit Dismisses All Claims Against Former Top Prudential Broker Capping 11 Year Quest to Establish Innocence," Reuters.com. Won appeal in the United States Court of Appeals for the Tenth Circuit (Denver) from an order requiring a criminal defense attorney to testify against his client before a Utah grand jury. Won appeal in the United States Court of Appeals for the Second Circuit based on a trial judge's error in preventing the jury from hearing evidence that an informant's FBI handler did not believe the informant had done anything wrong. "Error Leads Circuit to Order New Trial for Informant," New York Law Journal. Won appeal from a conviction for murder in 2015 committed in 1985, "Appeals Court Tosses Cold-Case Murder Triumph," www.syracuse.com. Represented the lead defendant against criminal and civil federal securities fraud cases against former senior employees of Bernard L. Madoff Investment Securities LLC charged with participation in Mr. Madoff's Ponzi scheme. Persuaded prosecutors to resolve indicted charges of fraud against a telecommunications executive with a non-criminal disposition and corporate plea. Persuaded the Financial Industry Regulatory Authority ("FINRA") not to charge an industry executive for violating Stock Exchange and NASD Rules. Persuaded prosecutors not to charge a corporate officer with racketeering and an attorney for securities fraud.